On 17 August 1840 French settlers landed at Akaroa and founded the first town. A few years later farms at Purau, Riccarton, and Pigeon Bay were established and it was from here the establishment and extension of the province grew. 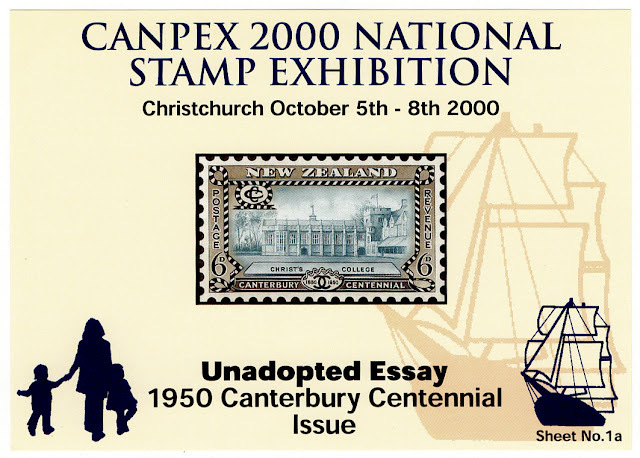 The first settlers chosen by the Canterbury Association (formed in England) disembarked from the first four immigrant ships - 'Charlotte Jane', 'Sir John Seymour', 'Cressy' and 'Randolph', at Lyttelton in December 1850 and this date is recognised as that of the official founding of Canterbury. 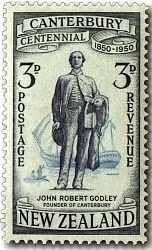 John Robert Godley had been placed in charge of the first colonists. These pioneers who chose to settle at Christchurch had to make a laborious trek over the hills separating Lyttelton and Christchurch by way of a rough track, which became known as the Bridle Path. 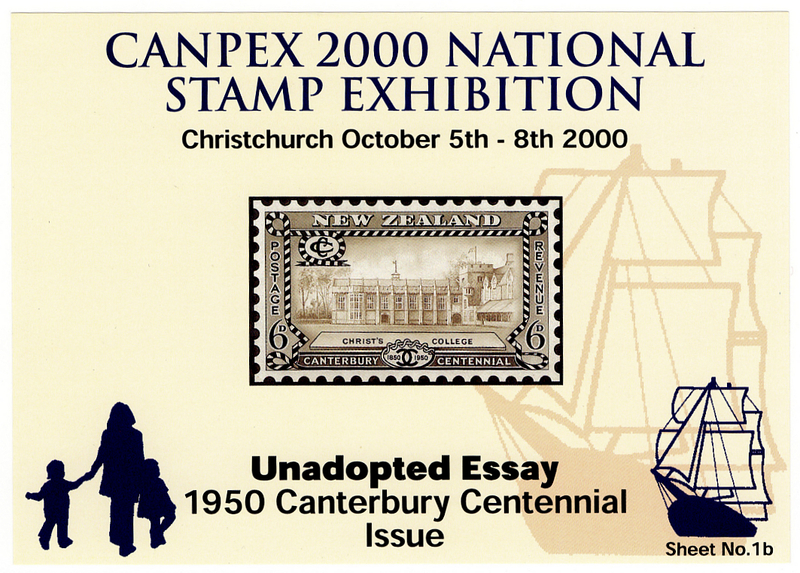 This five value stamp issue by three well-known stamp designers sets out to remember those early times and the people who made Canterbury and Christchurch what they are today. For many years this fine building stood in Cathedral Square, Christchurch. It was a feature, a focus, in the centre of the city. A building most people considered a landmark that would always be there. But alas, it was not to be. Nearly six months after the 4th September earthquake and second large earthquake hit the city on 22nd February 2011. This time much more damage was done, 185 people were killed and many fine buildings damaged or destroyed. The Christchurch Cathedral was among them, losing its steeple tower and being reduced to a battered, half fallen down shell. We wait now to see the cathedral that will replace it as no doubt one will. I really like this stamp. To me it stands out as on of the best of this period. The more unusual view of the cathedral, places the steeple as the centre attraction, with the cathedral building appearing to wrap itself around the tower. I once visited The Christchurch Cathedral and climbed the tower too. 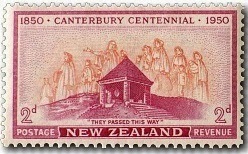 This stamp commemorates those pioneer women who followed their men to New Zealand. Landing in Port Cooper, now the Port of Lyttelton, the worse was still to come. Bravely on foot they climbed the hills and found their way down to Christchurch beyond. This wasn't an afternoon stroll. Climbing the rough foot trails over the Port Hills, they would be loaded with all they had bought from England, often helping or carrying young children as well. These brave, courageous women are celebrated and remembered in the memorial shown on this stamp. John Robert Godley (29 May 1814 – 17 November 1861) was an Irish statesman and bureaucrat. As Leader of the Canterbury Association's venture, Godley is considered to be the founder of Canterbury, New Zealand, although he lived there for only two years. 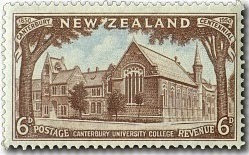 Now known as the University of Canterbury, the university originated in 1873 in the centre of Christchurch as Canterbury College, the first constituent college of the University of New Zealand. It became the second institution in New Zealand providing tertiary-level education (following the University of Otago, established in 1869), and the fourth in Australasia. Since then its always played a leading role in the higher education of New Zealanders. The University suffered a major set back in the earthquakes of 2010/11. Major damage was done to many buildings, some of which had to be demolished. Student numbers fell, forcing the University to cut staff and some research projects. Now (2015), as the surrounding city recovers and is rebuilt, the University is recovering too. My brother's son studied at this University. He always said what a great place it was, so steeped in history while offering modern courses relevant for today. He enjoyed both his time at the University and living in the city of Christchurch. An aerial view including Caroline Bay. 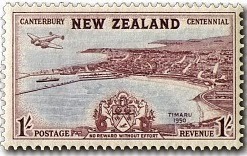 The city's Coat of Arms and motto appear at the bottom of the stamp. Māori canoes seem to have employed the site of Timaru as a place to rest on long journeys up and down the eastern coastline for many years before the arrival of the first Europeans in the 19th century. The area includes over 500 sites with traces of Māori rock art, particularly in the rock overhangs and caves of the Opuha and Opihi river valleys, to the west of modern day Timaru. Archaeologists have suggested that Māori tribes were permanently settled in the district before 1400 AD. European settlement began with the construction of a whaling station in 1839 by the Weller brothers of Otago at Patiti Point, close to the present town centre. A supply ship, The Caroline, provided the name for a local bay. Later a sheep station, known as The Levels, was created on land purchased by the Rhodes brothers. Few lived in Timaru until 1859 when the ship SS Strathallan arrived from England, carrying a party of 120 immigrants. Today Timaru has a city of 31,000 people, with a modern port and prosperous agricultural hinterland. It is the main centre for the South Canterbury region. A First Day Cover made from an ordinary cover. It has a clear post mark, dated 20th November, 1950. It is also an airmail cover going to Australia. 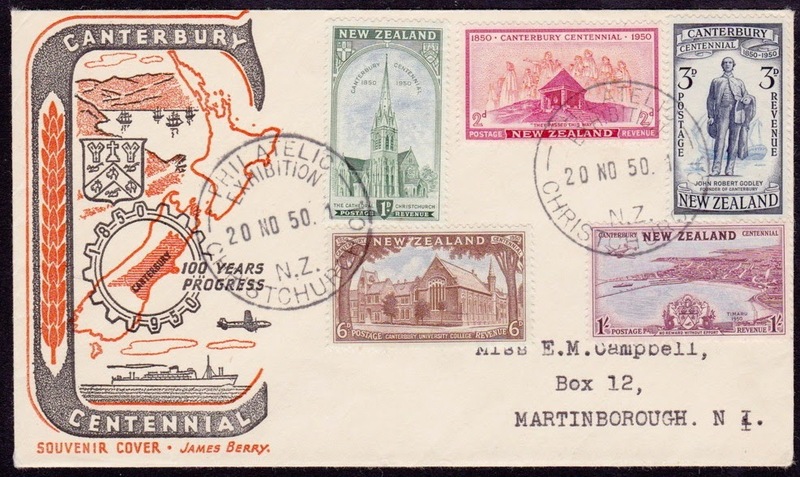 Our next cover is one designed by the famous stamp designer James Berry. 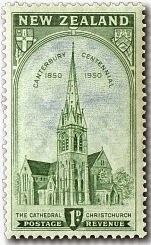 It was especially printed for the 1950 Canterbury Centennial with a map of New Zealand showing the Province of Canterbury. 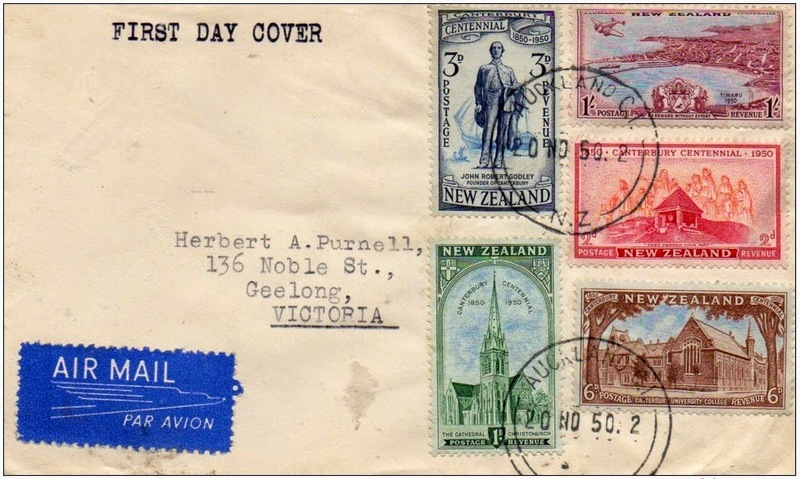 The special post mark is for a Philatelic Exhibition that was running over the First Day of Issue. 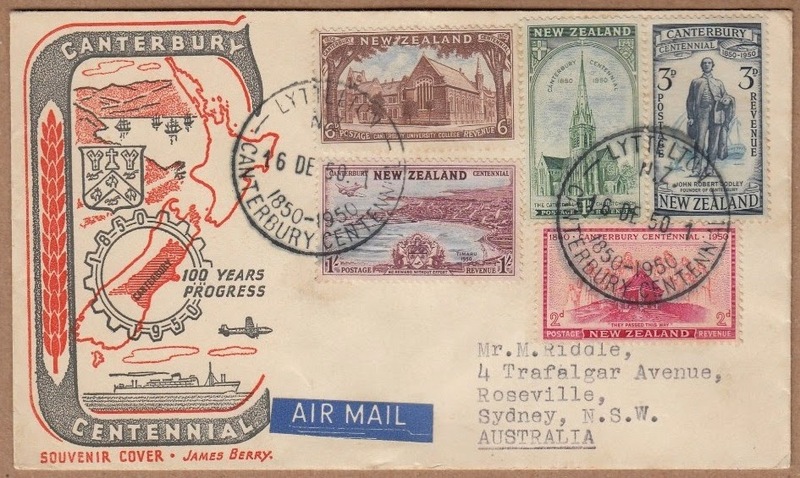 This last cover is not a First Day Cover because its dated 16th of December, 1950. It uses the James Berry special cover for a letter being sent to Australia. 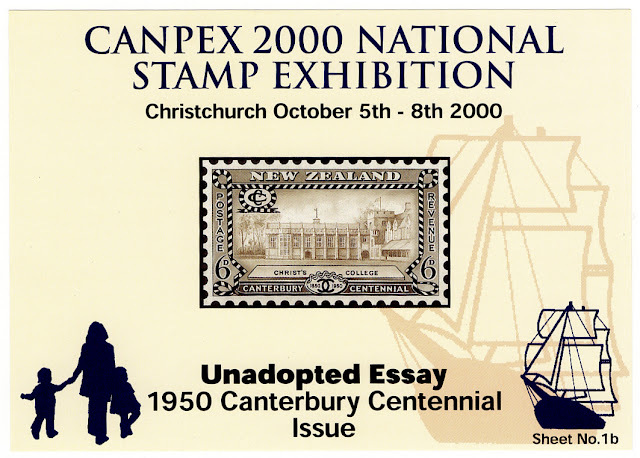 The Canpex 2000 National Stamp Exhibition issued these two collector sheets showing essay copies of a stamp designed for the 1950 Canterbury Centennial Issue but never used. The stamp is 6d - Christs College with two colour varieties.